We're off to see the Wizard, the wonderful Wizard of Oz! 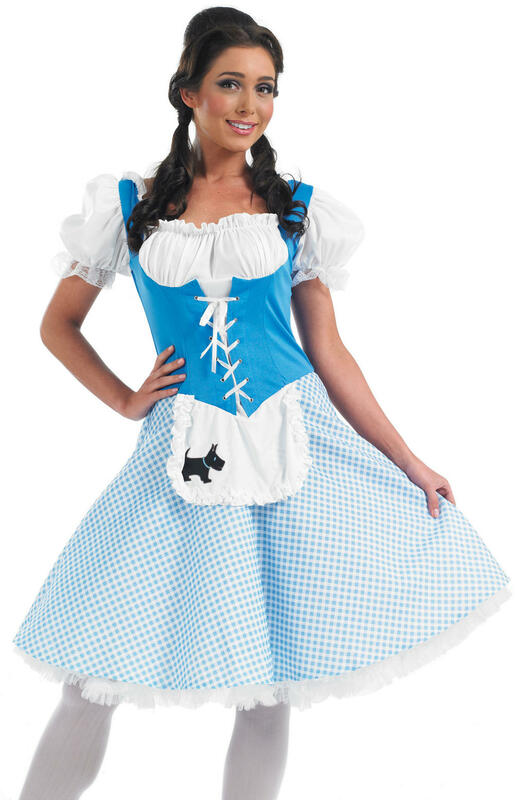 If you want to look pretty but are scared of dresses that bare all then never fear because we will have you skipping down the yellow brick road in this gorgeous Dorothy Long Length Ladies Fancy Dress Costume. The charming outfit includes a knee length dress that has a white top with puff sleeves and gathering to the chest, a fitted blue bodice with white lace ties, and a blue gingham skirt that sits at the knee with a white petticoat detail popping out of the hemline and an attached white pinafore with a toto print. Finishing the look is a pair of white hold up tights with blue ribbon bows attached. 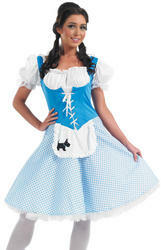 Get ready to show that Wicked Witch who's boss at your next film, musical or fairytale fancy dress party.